HullWiper cleans in the dark. 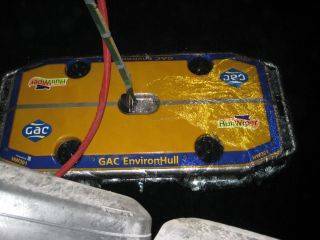 GAC EnvironHull's hull cleaning solution now available at second UAE port. GAC EnvironHull has expanded itsbrush-and-diver-free hull cleaning operation to Fujairah, six months after its global launch. Launched in Dubai in November 2013, the HullWiper Remotely Operated Vehicle (ROV) is an unmanned hull cleaning unit which uses adjustable pressure sea water jets as the cleaning medium rather than brushes or abrasives, resulting in minimal damage to the antifouling surface. Residues and harmful marine growths captured during cleaning are disposed of in an environmentally-friendly manner instead of being discharged into the sea as done using traditional methods. In response to enthusiastic market interest and consistent demand since its launch, GAC EnvironHull has now established a HullWiper ROV unit at the Port of Fujairah, on board the support vessel "Maggie 1." Fujairah is the only UAE port outside of the Middle East Gulf, sitting on the Indian Ocean coast just before the Straits of Hormuz. It is a bustling hub for a wide range of ship support and port activities, including GAC's ship supply service, spares deliveries, crew changes, and – now – GAC EnvironHull's clean and green hull cleaning operation. The first HullWiper operations at Fujairah have already been conducted, including one job performed during the hours of darkness – something not possible using traditional hull cleaning methods. Because its operation requires no divers, cleaning may be performed whilst vessels calling at the port are at berth to load or discharge cargo. The laden condition of the vessel presents no issue, as HullWiper can operate on vessels whether empty, fully loaded or at any point between with no additional costs or time penalties. Simon Doran, Managing Director of GAC EnvironHull Ltd., says: "These days, ship owners and operators are seeking solutions which both deliver tangible operational results and also enhance their corporate 'green' image. That's why we have seen consistent demand for our eco-friendly hull cleaning service since its launch, which we expect to continue or even increase. By bringing the HullWiper service to Fujairah, we are providing ship owners and operators with greater choice and yet another option for efficient vessel care." HullWiper has already been granted permission from the Norwegian Climate and Pollution Agency KFT to perform cleaning operations within all Norwegian ports as well as from the UAE Environmental Department and DP World for use in inner harbours at all quays inside the port of Jebel Ali.